Bright spark: Refilwe Machaba at the Samsung Electronics Academy, in Boksburg, Gauteng. For the last two years, Refilwe Machaba has been the top achiever at the Samsung Electronics Engineering Academy in Boksburg, Johannesburg. The Academy provides Grade 10 to Grade 12 students from participating technical high schools and others from further education and training colleges in Ekhurhuleni, with free hands-on skills training. Refilwe, who is in Matric at Katlehong Technical Secondary school, lives with his mother, who is unemployed and two younger sisters in Katlehong Dikole. 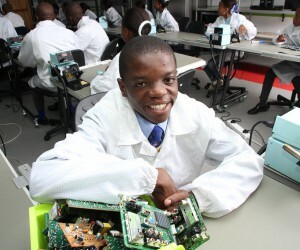 At school, he excels in physics and maths, and as has been shown by his performance at the Samsung Academy, he clearly has an aptitude for electronics as well. The Samsung Academy finds employment for those graduates who do not have the opportunity to continue with their studies. Out of this year’s 40 graduates, 17 have gone on to tertiary education, while Samsung has placed the remaining 23 graduates in jobs at its service centre, knock down plant and call centre partners. The company is proud that it has managed to place 100% of its graduates in jobs for two years running – a result of the Academy’s focus on practical, relevant skills to meet industry demand. Refilwe says the biggest challenge presented by the academy is balancing the commitment with the rest of his studies, but he says it is good practice for his university studies. 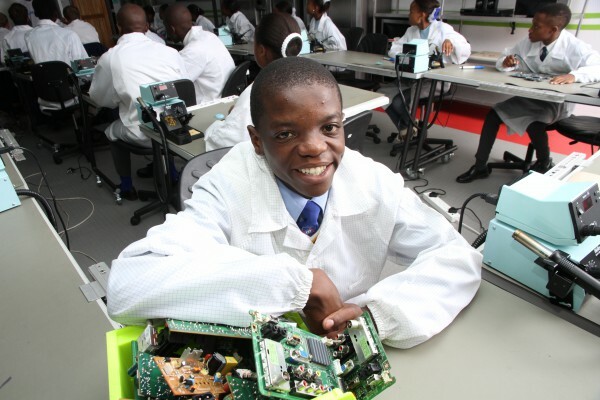 Samsung’s Electronics Engineering Academy is a part of the company’s commitment to developing 10 000 electronics engineers on the African continent by 2015. This ties in closely with the the government’s new growth path strategy, which includes the key target of producing 30 000 engineers in this country by 2014.